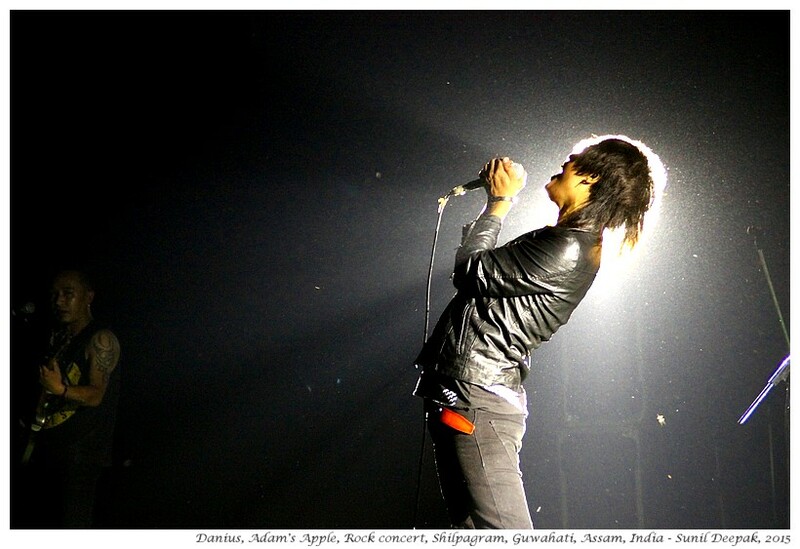 The picture above has Danius Marak, the lead singer of Adam's Apple, from that music concert. 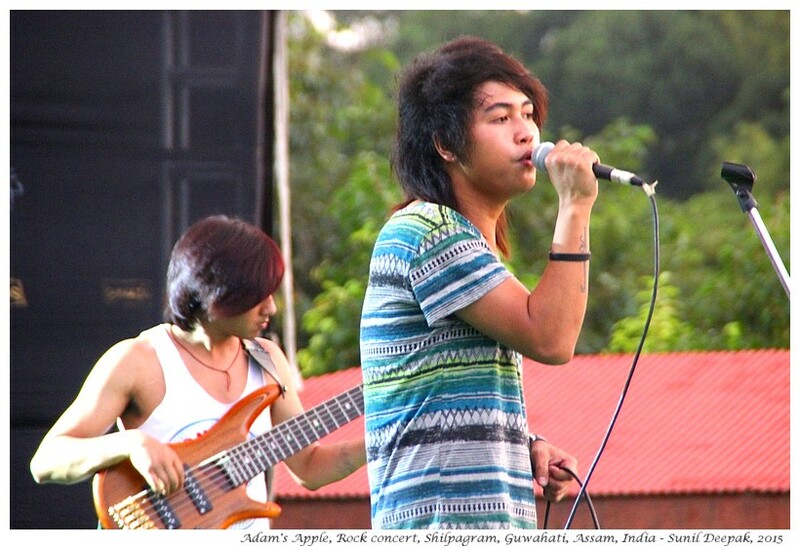 Adam's Apple is a rock music group from Darjeeling (West Bengal, India) that had won the Hornbill Rock Music festival in Nagaland in 2014. Let me start by explaining how I found myself at the rock music concert. I knew that 2 important dates related to one of the most important cultural and religious icon of Assam, Srimanta Shankar Dev are close - 15th is his birth anniversary and on 23th, his death anniversary. In addition, on 18 September, there will be Biswakarma Puja, an important day in the religious calendar of the north-east. 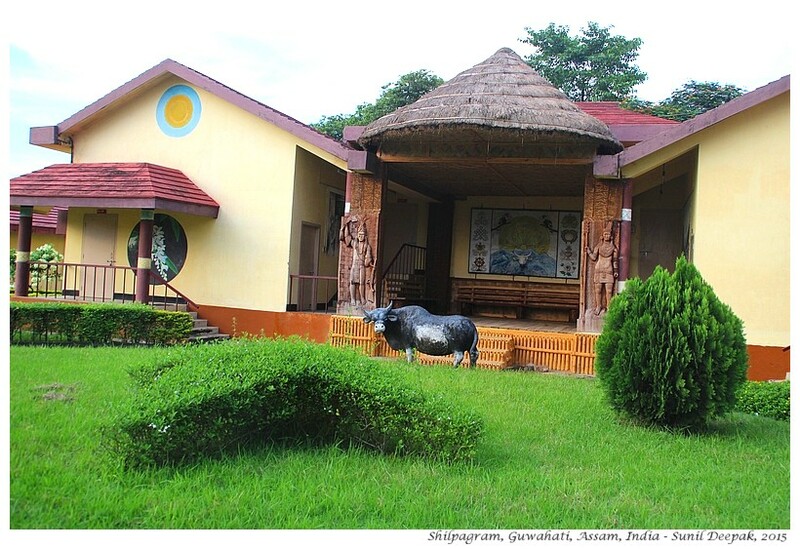 I wanted to know if any special events were planned at Kalakshetra, one of the most important cultural hubs of Guwahati. Though it was a day of Assam Bandh (strike), Kalakshetra was open. The person at the ticket office was very helpful. He told me that no cultural events were planned in Kalakshetra in this period and next big cultural event would be in October 2015 during the Durga Puja festivities. On my way back, on an impulse I decided to go and visit Shilpagram, that is located close to Kalakshetra. 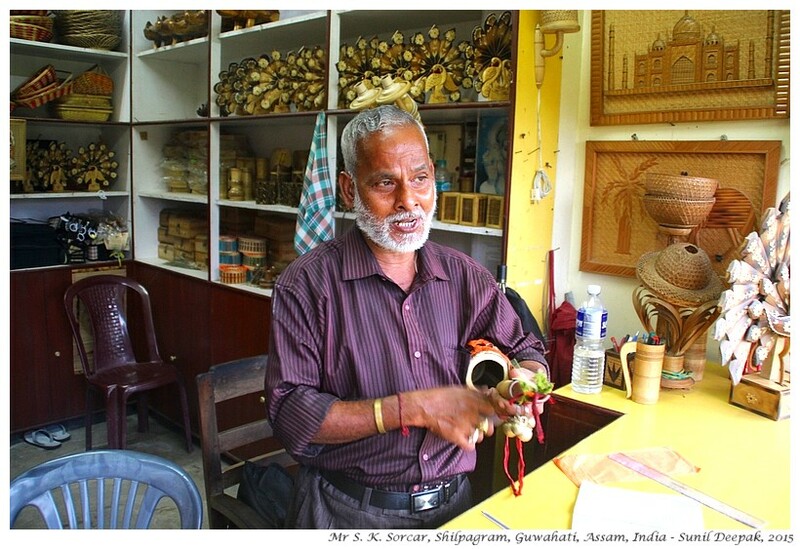 Shilpagram (literally "Village of crafts") is on Aurobindo path, just before Kalakshetra. Apart from Shilpagram, on the same road there are the Assam Film Museum, the state music school and the Guwahati Aurobindo centre. The film museum did not seem to be functioning and its gate was locked. Saturday was also the weekly closure day for Aurobindo centre. However, Shilpagram was open and no ticket was required for entering on that evening. "At 6 PM, there is some music festival", the guard outside Shilpagram had told me. It was only 4.30 PM, and my first reaction was that I did not want to wait there till 6 PM for the music programme. So I entered thinking that I would quickly visit and see what kind of things were there. It is used as a venue for holding handicrafts fairs and exhibitions. Since no fair or exhibition were going on yesterday, there was not much to see except for some buildings representing a few tribes. These buildings were decorated in traditional ways, but they were all closed and empty. 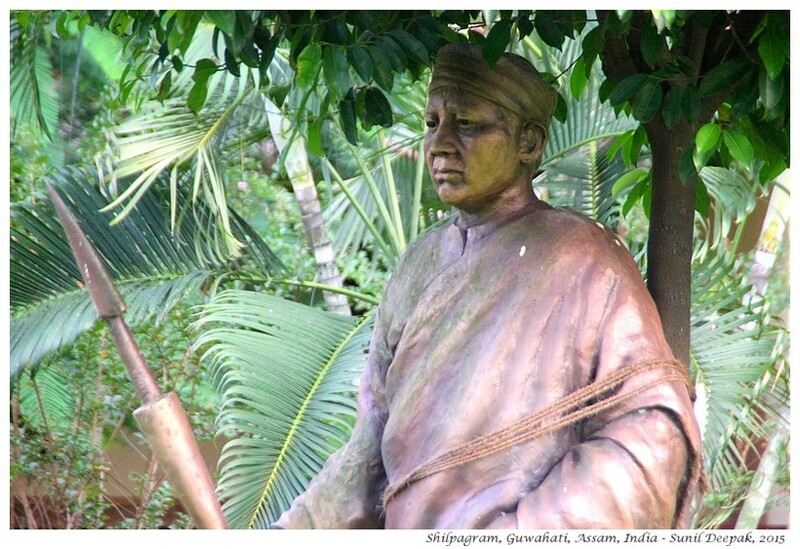 In one garden, a statue of someone was placed under a tree but I had no idea of who he was. 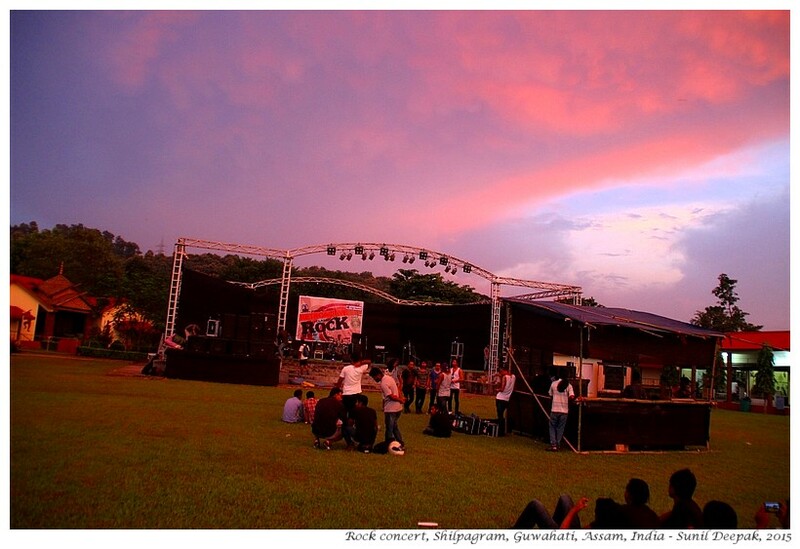 The sound of music was coming from the park at the centre of Shilpagram where a stage had been set-up. 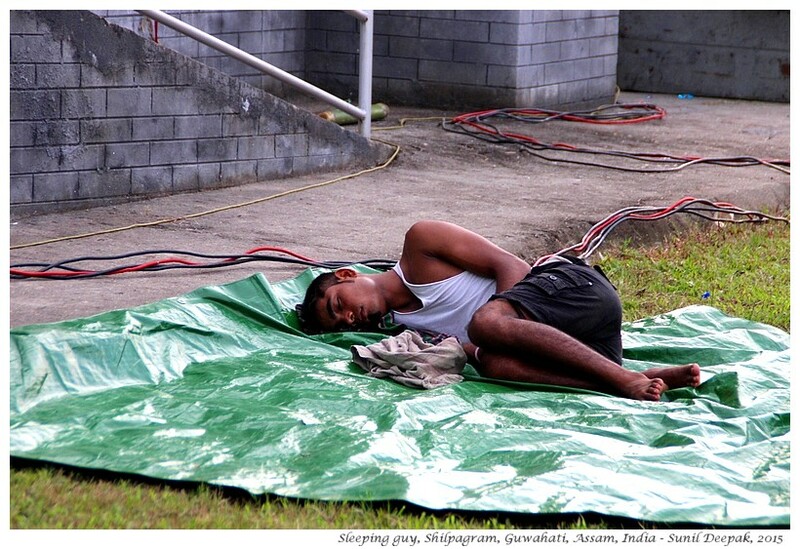 A young guy was sleeping there on a plastic sheet next to the stage, in spite of the loud vibrating sound of drums and guitars. It reminded me of my early days in India, when I could sleep in the middle of noise, lights, chaos and confusion, and not like now, when the slightest thing wakes me up or keeps me awake! 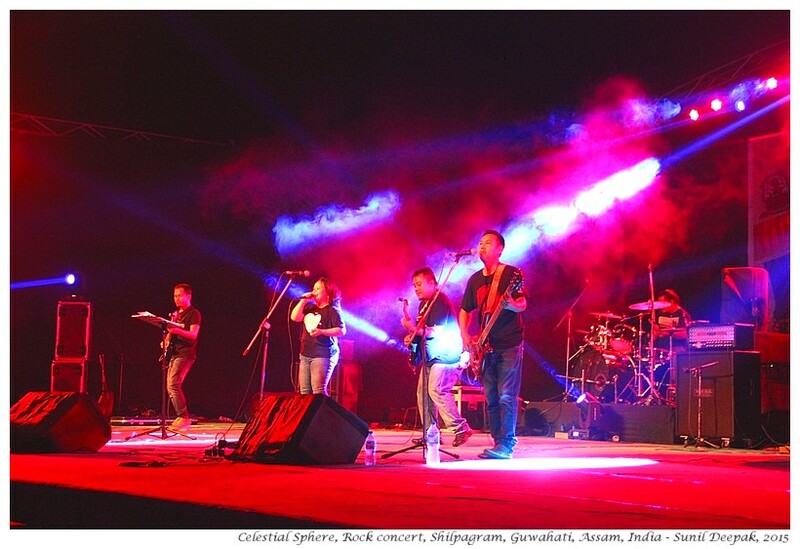 On the stage, a group from Diphu called the "Celestial Sphere" was rehearsing. Their vocalist had a nice voice. Behind them, a banner showed the name of the event - a "Retroactive Classic Rock Revival" music concert sponsored by Cafe Hendrix of Guwahati. I listened to Celestial Sphere for some time and then decided to visit a few handicrafts shops around the park. In one handicraft shop of Shilpagram I met Mr. Swaraj Kanti Sorcar, who had an Assamese prayer book open before him and was slowly singing a hymn. His voice attracted me and I stopped there to listen to him. "What are you singing? Your voice is very nice", I told him when he finished the hymn. "My voice was much better when I was younger", he said proudly and brought out a drum with a cord. He sang me another of his prayer songs for me, this time accompanied with music from his drum and the tinkles of small brass bells fixed to the end of a cord that stretched between the drum and his fingers. It was a song about Krishna, though I could not understand all the words. And it was amazing listening to him. That drum with stretched cord is called Bagoli (since it is held in the underarm or "Bagol") or Khamen. I was reminded of some Baul singers that I had heard at Kamakhaya temple during Ambubashi festival. Simple songs and music, and a voice filled with emotions that go straight to the heart. After his songs, I sat with him for some time, listening to his stories about his life. Meeting Mr Sorcar warmed my heart. While we were talking, some other group had come to do the rehearsal on the stage. Sounds of their music filled the whole place. It was a throbbing and pulsating sound, while the lead singer had a raw voice. I said good bye to Mr Sorcar, as I wanted to check this group. They were "Adam's Apple" from Darjeeling. I loved their music and decided that I wanted to stay there and to listen to them properly during the concert. There was still more than half an hour for the start of the concert. The sky covered with clouds had turned first orange and then red. There were not many persons there to listen to the music concert. I decided to take another walk around Shilpagram. In one corner I came across a group of high school girls, all dressed up. They had just had their cultural function in the auditorium and were now waiting for refreshments. They were happy to pose for me for some pictures, proud to show off their beautiful costumes. 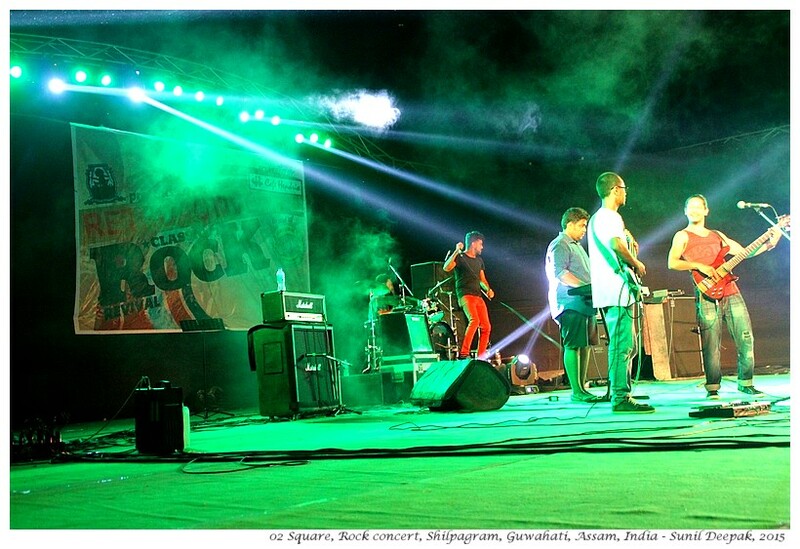 The concert was started by a group called 2 Squares from Guwahati. Their lead vocalist Gregory Sarma sang beautifully and with wonderful energy. The guitarist and the guy on drums were great. In some ways Sarma's performance reminded me of Robbie Williams. I did not know any of the songs they did, probably they were not retro enough for me, but it was difficult to stand still during this part of the concert. I am really surprised that this group does not have its own page on Google Plus or Facebook. Gregory Sarma has been part of some popular groups like Nakshatra, Faith and the Beat Route. 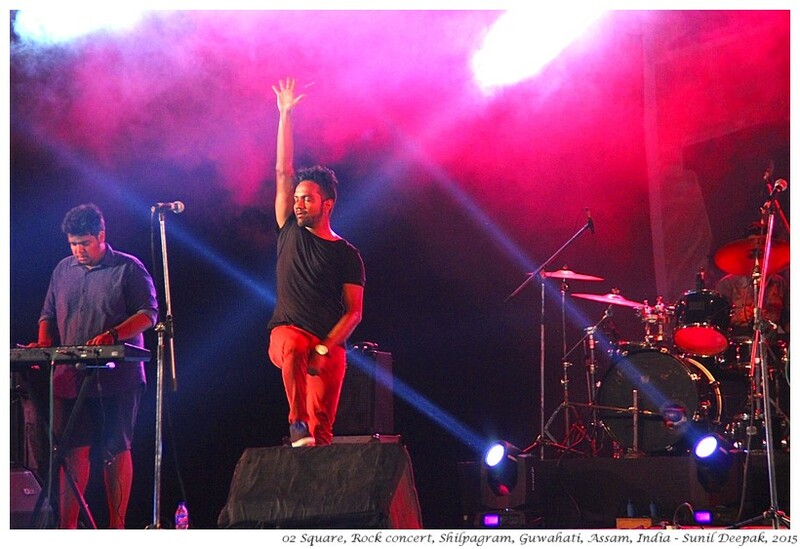 He came back to Guwahati earlier this year and has started this new group, 2 Square. Anyway I am sure that they are going to get a good fan following. 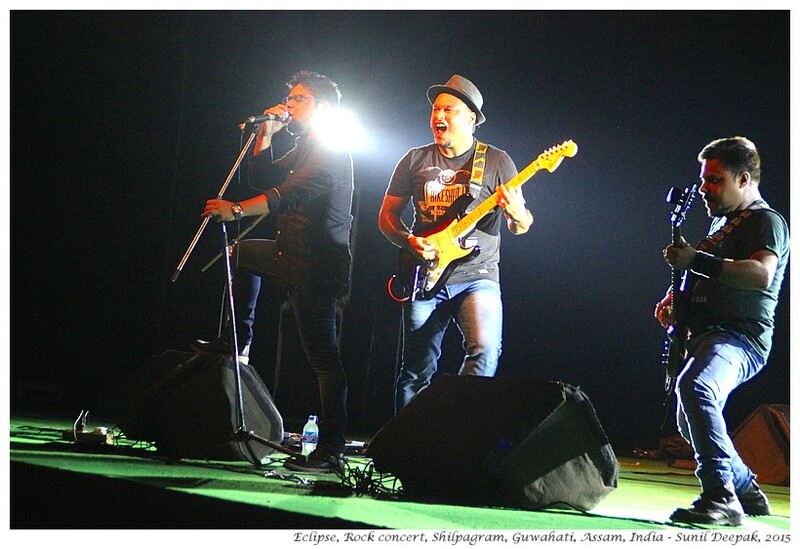 The lead vocalist of this group is one of the historical figures of rock music in Guwahati, active for the last 30 years. They had a female co-vocalist, a girl with a nice warm voice. They sang more retro songs including “Run to me” by Bryan Adams, that I could identify. Even the SKD does not seem to have a Facebook page or a website. I searched on internet, but I have been unable to find the names of the components of this group. Eclipse is another all-guys group. 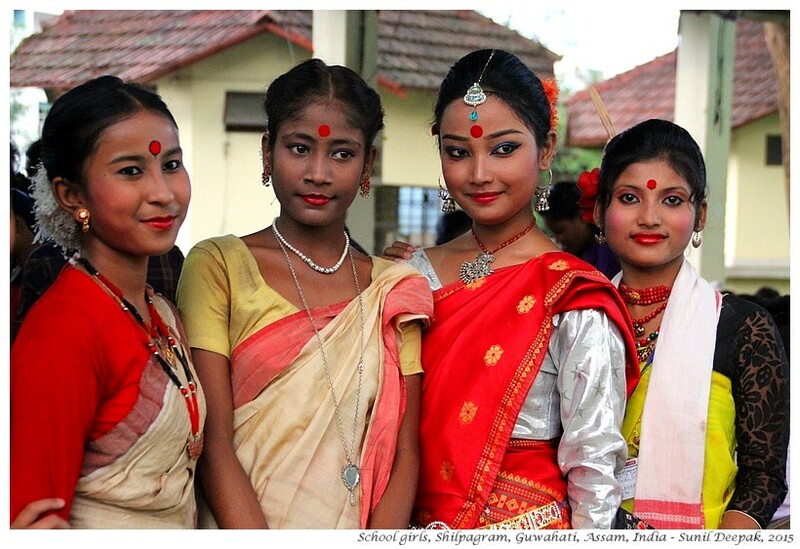 It is a historical group from Guwahati that was started in 2004. 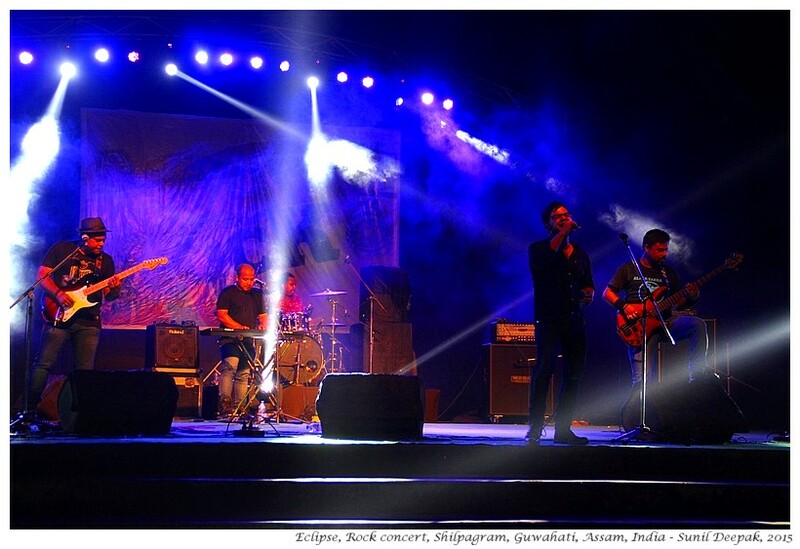 Its members are Kundal Goswami (Vocals) Rahul Kaushik (Bass) Sumit Baruah (Guitar) Rakesh Baro (Keyboard) Mrinmoy Edwin Singha (Drums). They are going to come out with a second CD soon and they sang two unreleased songs from this new album titled "Clandestine Resurrection". Their first album had a very poetic name, "A mouthful of moonlight". 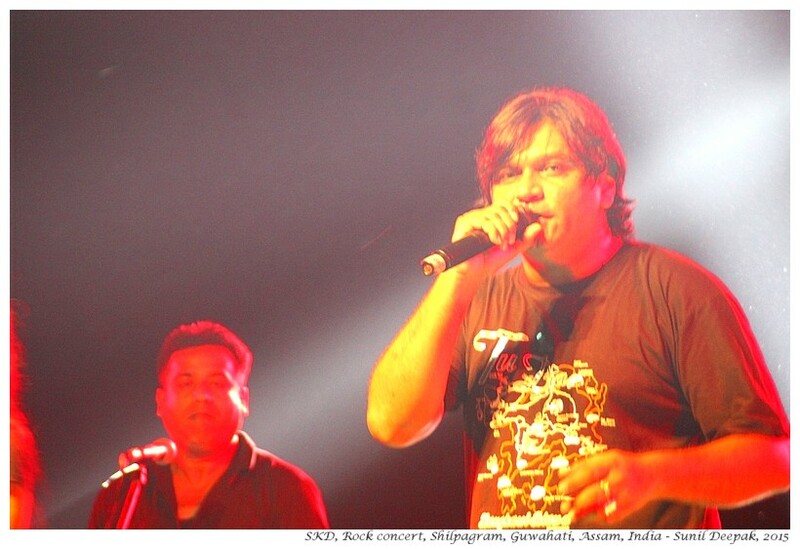 Their music is good, Kundal their lead vocalist, and the musicians are great and the group has a good energy. In my personal classification, they were number two in this evening’s groups. All their songs were great but I enjoyed most their version of the retro number of the Queen, “I want to be free”, because it made me relive my young days. Celestial Sphere group is from Diphu in Korbi Anglong. From the reaction of the audience this seemed to be a very popular group. 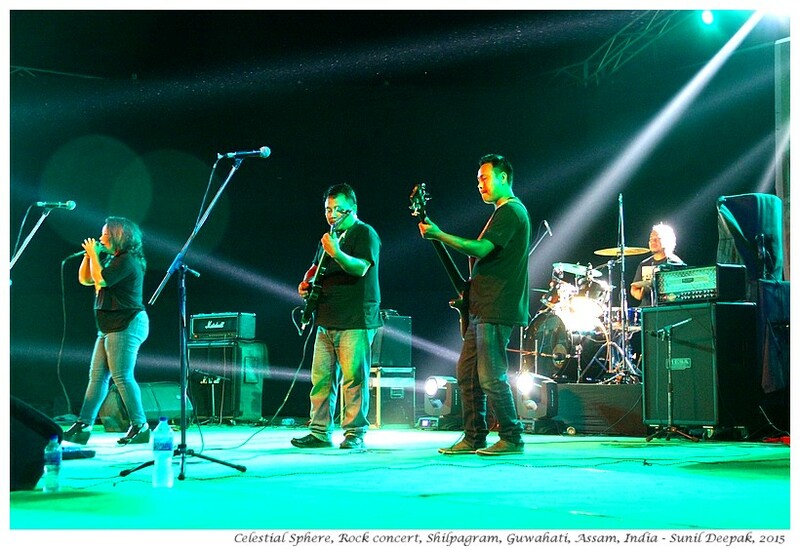 The members of this group are: Thengchum on Guitar, Lumar on Guitar, Edwardo on the Bass Guitar, Bendang Toshi on Drums while Dr Aleena Terangpai is the vocalist. 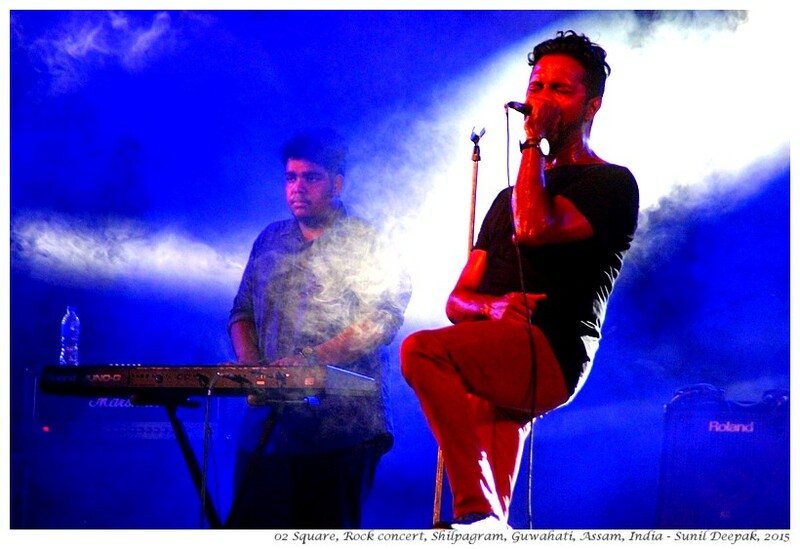 This group is considered as among the top 50 emerging rock groups in India. Aleena, their vocalist has a good voice and the guitarists were great. By the time the Celestial Sphere came, I was wondering if any of the groups would have anything in terms of fusion music? I feel that it is great to sing retro songs from US/UK singers but if you are a north-east group, it would be nice if occasionally you also add to your music something that represents your own culture and music, to root it to this land and moment. Celestial Sphere must have heard my wish, so they had one Korbi Anglong song in their repertoire. Its refrain sounded like “Say, say”. You can hear this song on their Sennheiser profile page. 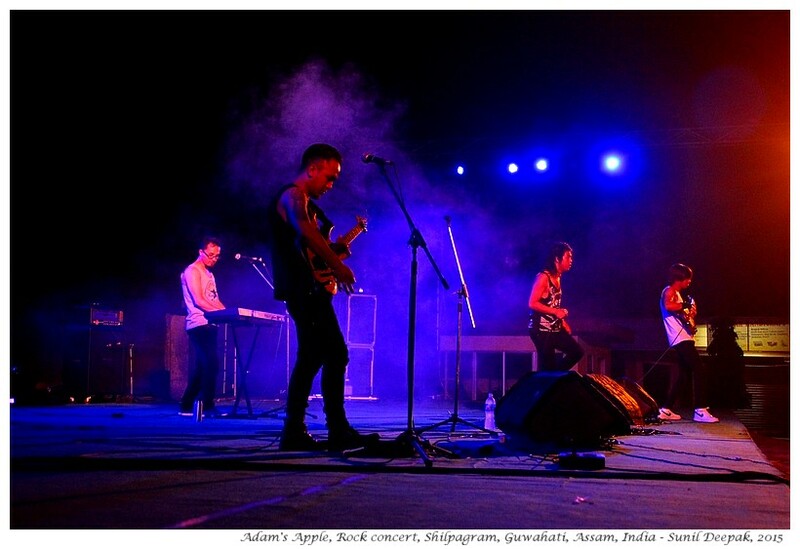 Like I wrote earlier, Adam's Apple are the winners of Hornbill festival 2014. 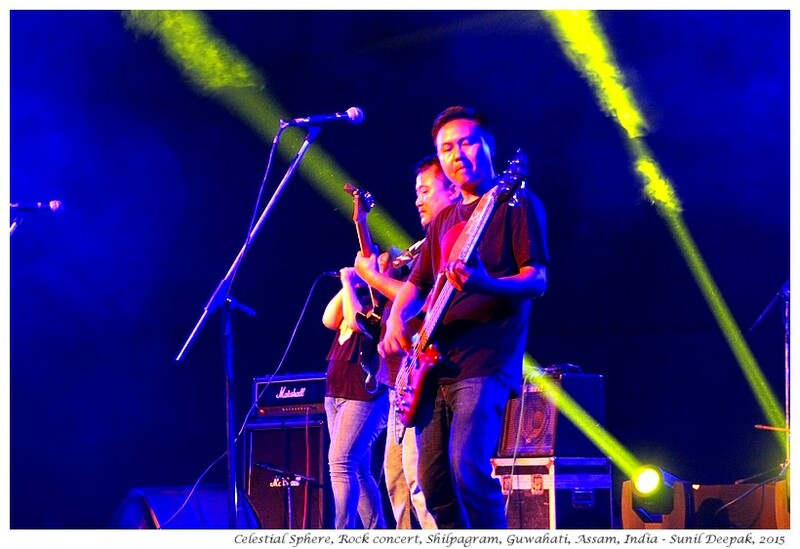 The members of this young group from Darjeeling are: Danius Marak (vocalist), Praggya Lama (Guitar), Sawan Chettri (Bass), Anil Pradhan (Keyboards) and Ushang Bomzom (Drums, battery) - BTW, I think that Bomzom is a wonderful name for someone who likes to play drums! Danius is the new vocalist for this group I was told. It was the music of this group that had hooked me and made me stay there to listen to this music concert. However by the time they came, I had a slight headache and my hips and knees were hurting, so I was wondering if it was time for me to start my walk for going home. Danius, the lead vocalist of this group looked like a teenage Mick Jagger of the Rolling Stones. 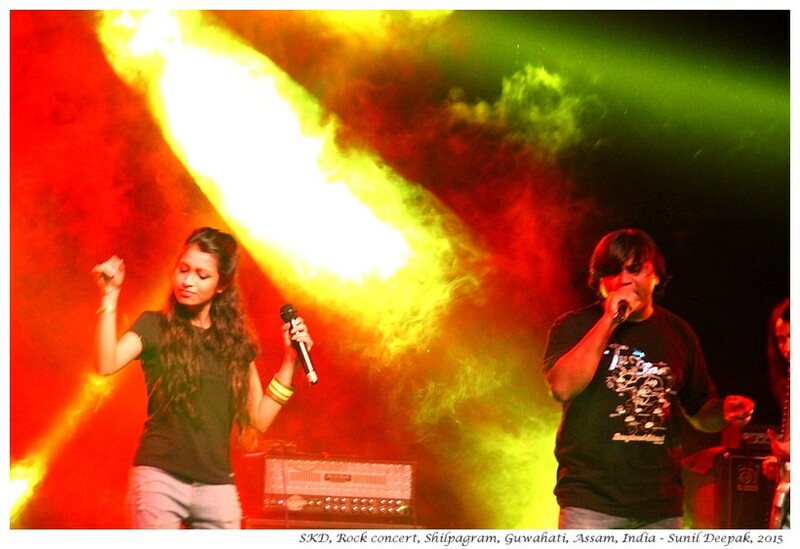 The two guitarists, Praggya and Sawan, also looked very charismatic. The sound of their first song started with a raw energy-filled scream. However, something happened to the electrical system and the group was suddenly soundless. They smiled and waited patiently while the problem was resolved. They restarted and once again, not even one minute into their song, the electrical system failed again. I thought that it was kind of a divine sign for me to leave. I still had to do a three km walk to my home, and I had no idea what to do for my dinner. So reluctantly, I left the music concert. The whole evening was a wonderful experience, probably because it was so unexpected. 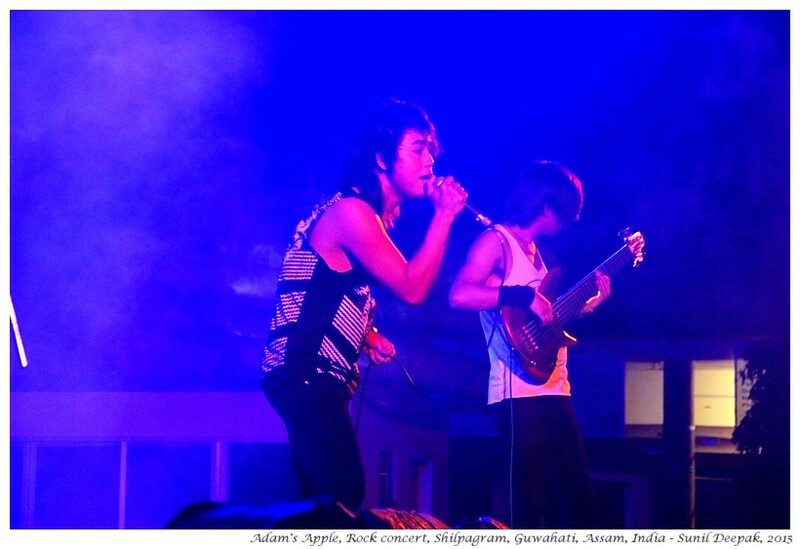 From the event poster, I have seen that there were 2 more groups in the programme after Adam’s Apple – Still Waters from Gangtok and Spreading Roots from Guwahati. I am sorry that I missed them. I had never been to a proper rock music concert before. Before this experience, if anybody had asked me, I would have said that I don’t like rock music concerts, that they are just too loud and noisy for me. This concert was indeed noisy and loud. Yet I discovered that I enjoyed it. That the strumming of electrical guitar and bass can give me a high. That the raw screams make my feet feel like dancing. This experience also made me aware that I am a photography-junkie. I loved the music and the collective experience of being part of a group that is swaying to music. But I loved even more, looking through the lens of my camera and framing pictures of the concert. People who were there as parts of the groups, if you wish to receive your pictures in high resolution (obviously free of cost) do let know - it will be a pleasure and an honour. Compared to the quality of the groups, and considering that it was a free entry event, I think that the audience there was very limited. This concert certainly merited a much larger group of people in the audience. I hope that next time, they will publicise such events better. I think that some of the pictures that I have clicked in this are wonderful, many are a little blurred and abstract, almost like poetry. 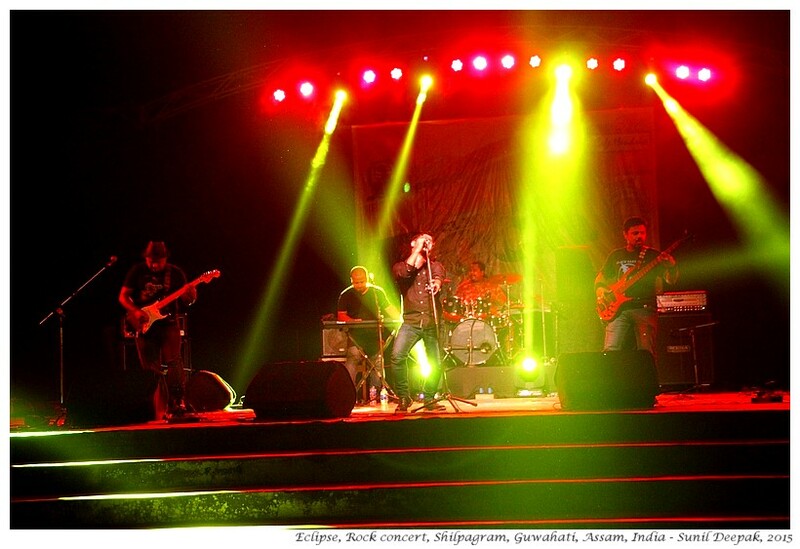 Let me close this post with another beautiful picture of this memorable unexpected musical evening from Guwahati. This picture was taken while we were waiting for he concert to start and the sky had started to turn red. How interesting it all looks. Bands from the North East are so good at western music. Such a pity the audience was thin. Thanks Woolgatherer. 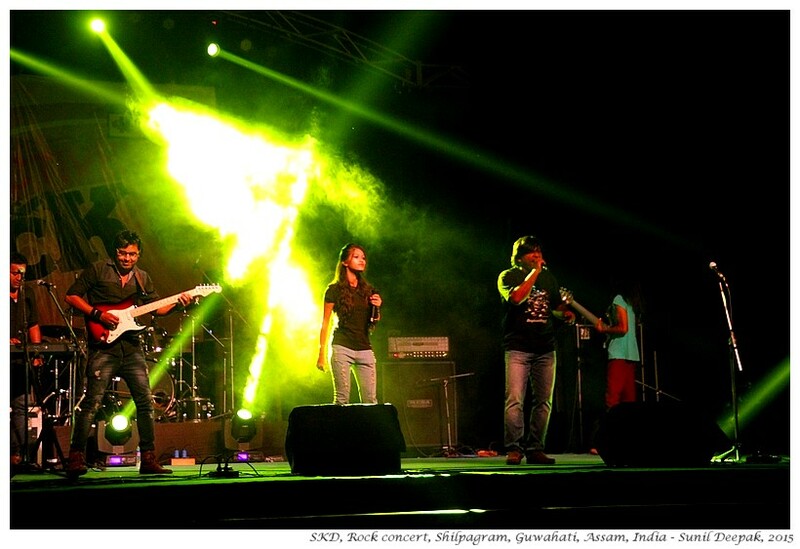 I think that NE bands are also good in their own traditional music but that is less accessible to rest of India. However, for western music, they do have some really nice bands. Wow.. I am glad I chanced upon your blog and yes, you are an amazing photographer. I am not a great fan of rock music but maybe I should give it a shot too.